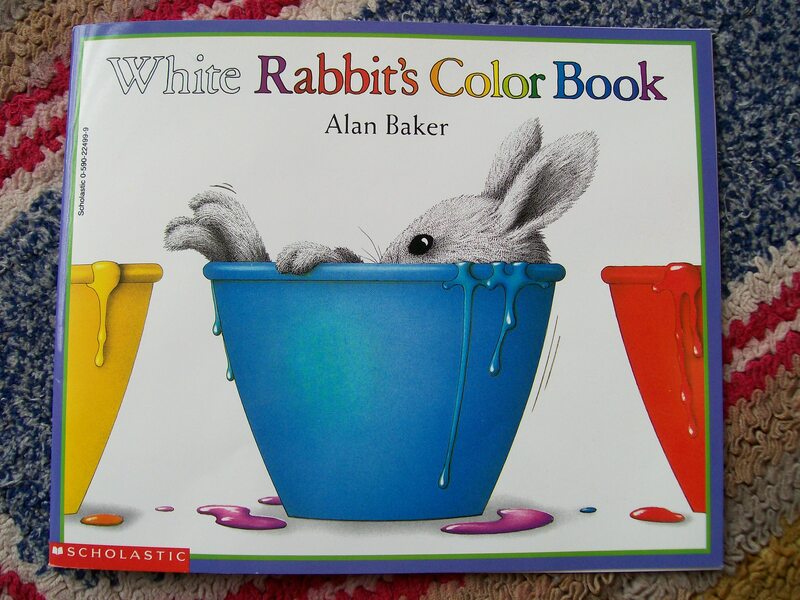 In White Rabbit’s Color Book by Alan Baker, an adorable realistic looking rabbit acts in a very unrabbit-like way when she comes across three big tubs of paint. First, she hops into the sunshine yellow tub and becomes a beautiful bright yellow. The red looks enticing too, so in she hops. Look at that! The rabbit has become orange. After a quick shower, she begins experimenting with the other primary colors. This very cute, very simple picture book is a perfect beginning lesson in primary and secondary colors. Of course, after reading, who could resist breaking out the paints and doing a little experimenting of your own? You wouldn’t want to just take white rabbit’s word for it without trying it out yourself! How much of each primary color do you need to add? What happens if you keep adding more yellow to that blue? Use cotton swabs for easy clean-up and for promoting pre-writing skills. They’re perfect for exercising the pincer grip muscles needed to grip a pencil. While you’re at it, check out Alan Baker’s other rabbit books. Gray Rabbit’s Odd One Out is another favorite of mine.